For a high number of fertile eggs, roosters need to like the ladies in the breeder house - and vice versa. Good mating between healthy and well developed attractive birds results in strong embryo's and a high number of fertile eggs. Not only breeding behaviour contributes to high numbers of fertile eggs of the best quality, also the reproductive system needs to function perfectly. If not, this may lead to a high number of misshapen eggs and shell defects. Some eggs fail to hatch, other surviving embryo's get contaminated because the defence mechanism against pathogens is lost. Eggs with cracks and floor eggs should not be placed in the incubator! The defence mechanism of the egg consists of a mechanical (physical) barrier and a biological barrier, comprised of a number of biologically active substances in the white and yolk and the pH of the white. The mechanical barrier of the egg consists of the shell, together with the waxy membrane covering it known as the cuticle, and the shell membranes. The egg shell itself consists of two layers – the outer layer, called the spongy layer, and the inner, mammillary layer. The shell contains about 7,000 to 17,000 pores, with considerably more of these located at the blunt end. The diameter of the shell also varies (10 to 60 μm). The outermost physical defence that a bacterial cell encounters on an egg is the cuticle. The cuticle is a very effective barrier to water. Despite the fact that the cuticle allows gas passage, it seems to effectively fill the pores of the eggshell. However, this defence is not perfect. A small percentage of eggs are laid without cuticle; these eggs may easily be contaminated by water and bacteria. Even when cuticle is present, for the first few minutes after lay it is an ineffective barrier to bacterial invasion until it hardens. Nevertheless, the hardened cuticle is the major barrier to liquid and therefore is of utmost importance in bacterial exclusion. The cuticle functions most effectively within 96 hours after the egg is laid. It has been demonstrated that the cuticle can be damaged by enzymes of some bacteria, such as Pseudomonas or Salmonella. Washing eggs can also damage this layer. Cuticle coverage may vary between eggs, and large differences between breeds and breed age may exist. The eggshell is an ineffective barrier to bacterial penetration. The pores are wide enough to allow entry. Eggshells characterized to be of excellent quality (from eggs with specific gravity above 1.090 and presumably thicker shell than poor quality eggs) were found to be more resistant to penetration by salmonellae, possibly because of the longer time needed for bacteria to move through a thick shell. The shell membranes adhere to the inside of the shell. These function basically like a filter, and are less permeable to bacteria than the shell itself. The speed with which bacteria penetrate the shell membranes varies depending on the type of microflora. Eggshell membranes do not have an inherent anti-bacterial property and can be penetrated by bacteria. However, the membranes do add some protective value to the shell alone, improving the ability to hold out bacteria over the short term. The time needed for bacteria to penetrate the combined inner and outer eggshell membranes is not clearly related to the amount of open space between fibres in the outer surface of the outer membrane. 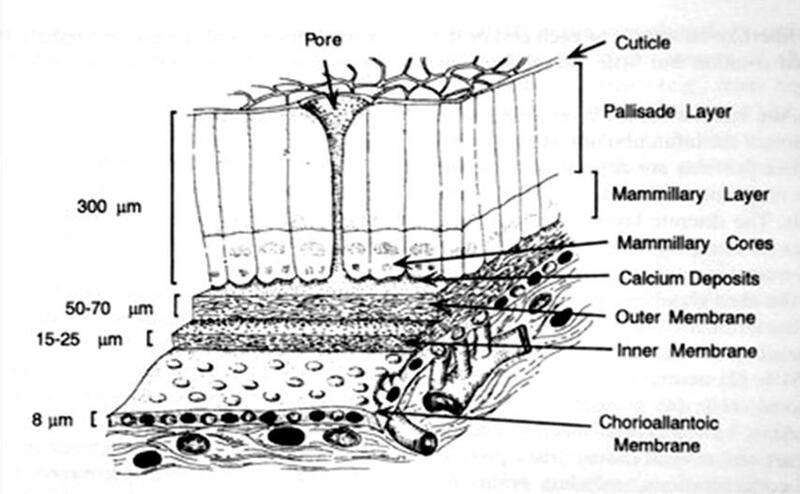 When comparing the shell, inner, and outer membranes for ability to prevent bacterial entry, the inner membrane is the most effective, because of the tighter meshwork of the inner membrane relative to the outer membrane. Bacteria introduced onto the shell membrane via the air chamber do not penetrate the white until after 4–8 days. Sometimes the shell membranes obstruct the micro-organisms for only 2–3 days, or even 1–2 days. Enzymes produced by bacteria are thought to facilitate penetration of these membranes. After micro-organisms have overcome the defences of the cuticle, shell and shell membranes, their multiplication is inhibited by the structure of the albumen, which deprives them of easy access to nutrients. The layer of thick albumen in the fresh egg makes it difficult for bacteria to move towards the yolk, while the chalaziferous layer, together with the chalazae and thick albumen, keep the yolk in a central position, significantly delaying infection. The vitelline membrane surrounding the yolk also has antibacterial properties. It not only constitutes a physical barrier to bacteria, but also contains biologically active compounds, such as lysozyme, conalbumin and ovomucin. An important element of antimicrobial defence in the first period of the life of the chick is yolk antibodies (IgY). Yolk immunoglobulins initiate the complement activation pathway in birds, thereby initiating the process of destroying pathogenic microbes and host cells infected by them. They can exert a kind of antibacterial activity against pathogenic microbes by binding and immobilizing them, thus restricting or inhibiting their growth, replication or colony-forming ability. Eggs with cracks say welcome bacteria! Best is to discard these eggs from the incubation process since they don't hatch anyway. 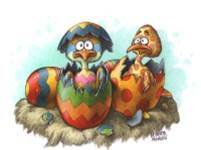 If they hatch, the bird will die within days. Make good records to inform the breeder farm when the percentage of eggs with cracks get too high. The same holds for floor eggs. It makes no sense to incubate dirty floor eggs. Floor eggs give poor hatch results, and chicks will die at the farm and infect others as well. Integrators who want to reduce the use of antibiotics should discard all floor eggs, which will yield more chicks of better quality. In the past, broiler farmers believed that yellow chicks were of better quality than white chicks... So the hatcheries gave the chicks a nice yellow colour with formalin. When formalin is used in the hatchers, it reduces the bacterial load on dust and eggs. So offspring mortality by naval / E-coli infections will be reduced. 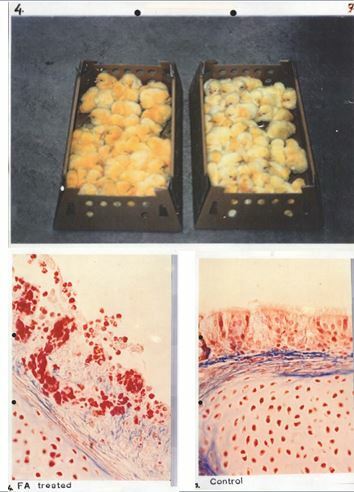 However, it appeared that mortality by respiration diseases was increased, because formalin exposure destroyed the epithelic layers in the trachea of young birds, see the pictures below. Pale white chicks are the result of subtimal incubation process. These chicks hatch with a large residual yolk, and all yellow pigments are in this residual yolk and not in the feathers. So yellow chicks are indeed a measure for good quality chicks, at least when formalin has not been used!! 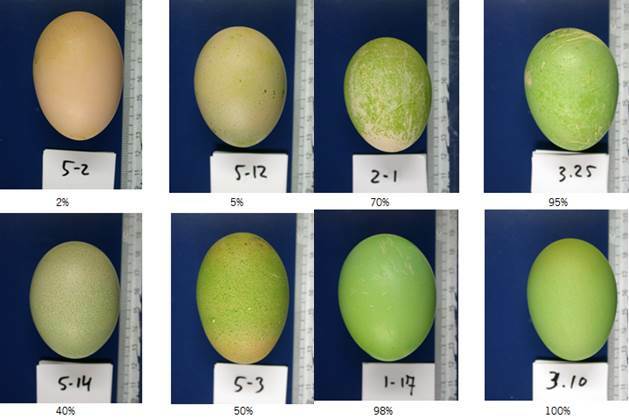 This can be achieved when hatching egg hygiene protocols are good, and when floor eggs are rejected from the incubation process.